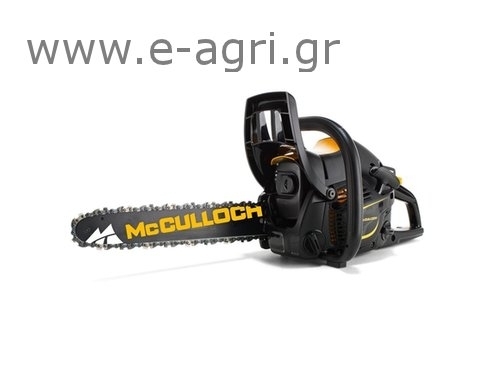 New model, ideal for cutting close to home, such as cutting branches, firewood or wood for various constructions. Equipped with OxyPower engine for more power, lower fuel consumption and reduced exhaust emissions. Easy and fast start thanks to Soft Start, fuel pump and choke / starter. Transparent fuel level indication. Built-in plug wrench handle. Quick and easy chain tensioning and positioning the blade withouttools. Makes it easier to start your chain saw. Reduces resistancecheiromiza40%. The manual pump supplies the carburettor with fuel and makes iteasierto start with fewer pulls. The combined choke / stop enables faster boot and greaterreliabilityby reducing the risk of engine stuffy noses. Activated with either the right hand or automatically by theinertiafor greater security. Equipped with the efficient air purification system CCS forgreaterdurability and less maintenance demanding. Effective anti-vibration system for efficient work longer. Thehandlesare isolated from the engine and blade for less vibration. Easy start due to the fuel pump and the system soft start reducestheresistance of cheiromizas to 40%. The series McCulloch not only distinguished for its attractivedesignbut also for its functionality thanks to slim body, low centerofgravity and flat base. The rear handle is ergonomically designedandswitches are clustered near the hand controls.